You may have heard of Work Must Pay. It’s a campaign group whose members protest outside businesses which use JobBridge to hire staff. It includes members of the Connolly Youth Movement. 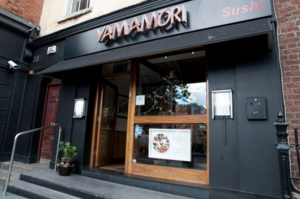 It recently held a picket outside Yamamori Sushi on Lower Ormond Quay, Dublin 1. Conor O’Donovan, a journalist with Trinity News, accompanied the group. Best JobBridge Ever JobBridge Journalism JobBridged? Whose Bridge? Posted in Misc and tagged JobBridge, Pickets at 1:56 pm on March 3, 2015 by Broadsheet. Do you not approve of James Connolly? You one of these idiots who thinks any reference to the signatories of the Proclamation are to be viewed in the light of the IRA of the 1980s? Far from it, but Connolly Youth are not Connolly, they’re a bunch of bar stool socialists with a chronic fear of work and an uncontrollable need to protest. I’m fairly agnostic on James Connolly while I applaud his bravery. No, I am not an idiot. I despise Communism. I despise the Provisional IRA. if it gives somebody experience in an area that requires some area of expertise, and there’s a possiblity of a permanent job out of it afterwards, or at least something worthwhile to lash onto the CV, Jobbridge probalby isn’t perfect, but it’s better than nothing. If it’s making sangwidges in S*b**y and they’re only taking JobBridge people because it means they don’t have to pay somebody themselves, or they’ve previously had paid people do the work, then it’s bad. In both cases the taxpayer is subsidising (in most instances) a private business, so of itself that’s not a good thing. In the former case, if there’s the chance that a person will have skills to enable them to get off the dole, then it’s probably a pill worth swallowing. Didn’t realise Yama hired job-bridge slaves. Won’t be going back there. Slaves? Dictionaries are big books containing actual definitions of words. Now available online! Well that tells you all you need to know about his attitude. Probably an IBEC or Fine Gael member. JobBridge – Increasing unemployment since 2011. I’m not usually a fan of the more radical left-wing political groupings…but 100% fair play to them on this. Nobody should be expected to work a 35/40 hour week for free. Publicly shaming businesses attempting to take advantage of people like this is a very effective way to go about things, hopefully it becomes more common. I don’t think anyone would argue that internships *can* be a good thing if the gig leads to full time employment in a proper career. But stacking shelves in Tesco does not require 9 months training and neither does cooking noodles, you would learn both skills in under 9 minutes to be fair. 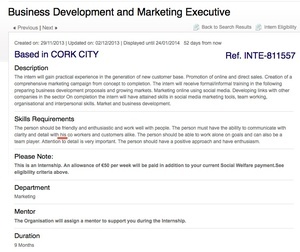 Unpaid Internships in low skilled work are nothing more than 9 months exploitation, all facilitated by the Labour Party to benefit business owners with free labour, many of whom will be voting for Fine Gael in their droves at the next election to ensure that the exploitation will continue. Just because they are trained doesn’t mean that they are experienced. Surely someone working and gaining experience in a kitchen is a pretty good Job Bridge placement. If they were cleaning the dishes or scrubbing the floors all day then I would agree it’s not right. This is called being a commi chef, it’s been a traditional part of a chefs training for years, and was always a (not always well) paid position. So what’s changed? A trainee chef still does the same ammount of work as he/she would have 5 years ago, so why has their value and worth to a company plummeted? Because Joan Bruton said so? Not to be harsh, I’m not having a go, but this is my issue with Job Bridge, people worked junior positions for decades, earned a few quid and got trained in AND had the dignity of earning a crust and paying their way in the world. JB is a scam for Labour to massage the unemployment figures, as if you’re on JB you’re not counted on the dole, so bingo “unemployment is down” we’ll be all told at the next election.. I hate these thuggish assholes showing up intimidating people. you have a beef? take it up to your local TD you wannabe socialist scum. What if you have beef but also want the beef noodles? I never saw Irish people working there, only foreigners, you see the middle class hipster paddies masquerading as friends of the workers at the door though, inciting boycotts. You can f*ck right off, get a job you numpties. I got here late and I don’t know all the details but, as an average Broadsheet reader I’d like to add my voice to whatever fashionable cause people are espousing here. Furthermore, I think those other people are bang out of order and probably support organisations that oppress the LGBT community/the working man/those with intellectual disabilities/those currently in negative equity [delete as appropriate]. But what about the water charges?! That’s how to stop shabby and shady business behavior.